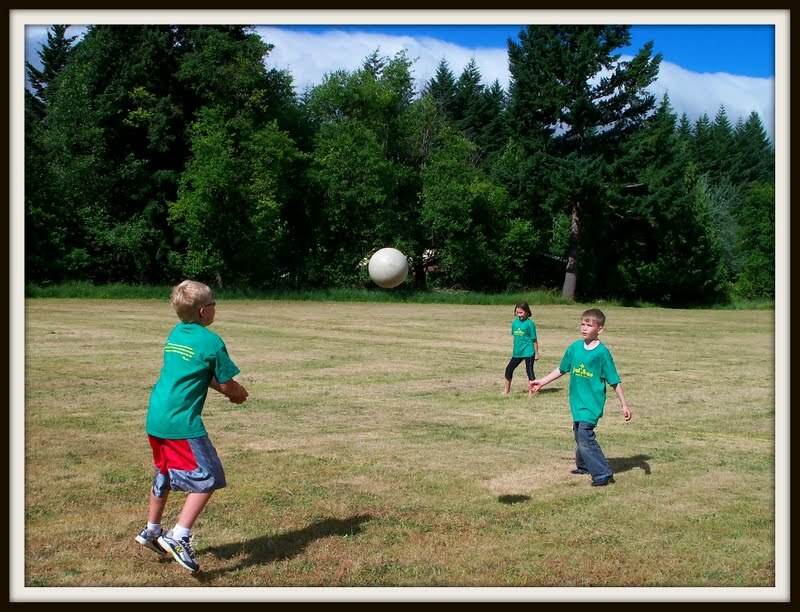 A couple of weeks ago, our little bitty church hosted a Sports Camp at the local school. 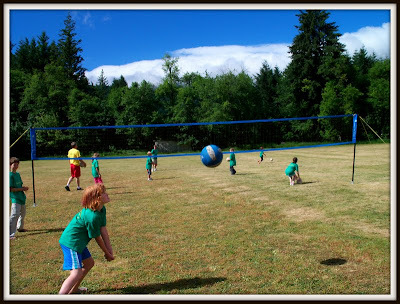 "Erik and I are coaching the volleyball portion of our Sports Camp/VBS and it feels really cool. Volleyball was a big part of our "courtship" and now we're coaching our own kids and their friends in a little volleyball camp. I have to admit, it's been a bit of a dream!" It really was a bit of a dream. Volleyball was such a huge part of my summers growing up in Minnesota. We would go from house to house a couple of nights a week to play volleyball and eat yummy food. Nearly everyone had a net and a bag of lime in the barn to make the boundary lines. It was a great sport and a cheap sport to do with the huge families like we all had. When Erik and I met, we also spent a lot of time on volleyball courts; grass, sand and gym courts. I remember being impressed with his kindness on the court, he was very gracious and was quick to offer a "oh sorry, that was my fault" or "nice one". I noticed, he certainly caught my eye. And uh, his skill didn't go un-noticed either at 6' 2"... well, let's just say, the man could play! So, years later when we were in wedded bliss and ready to put down some roots in Washington, one of my criteria in looking for a house was a yard flat enough and big enough to play volleyball. It didn't look very likely as we scanned the Columbia River Gorge for a home, but we found one, one might even say God planned it just for us. We haven't played a lot of volleyball in our yard yet, but we have the net and the space and now that the kids are old enough to learn the game, we hope to make many family memories playing volleyball in our yard. Elena and Deacon picked up some basic volleyball skills and a serious interest in the game. Yay! It was so fun to do the Sports Camp with the whole family, Erik even took the mornings off so he could participate. It certainly wasn't easy, we were all thoroughly exhausted when the week was over, but all of the joy and special memories made it all so worth it! Volleyball dreams do come true! The Latest Additions to our Ducky Family!